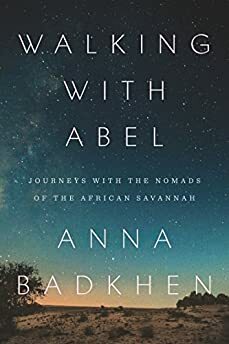 Largehearted Boy: Book Notes - Anna Badkhen "Walking with Abel"
Book Notes - Anna Badkhen "Walking with Abel"
In precise and arresting prose, Anna Badkhen lyrically recounts her time embedded with nomadic cattle herders in southern Mali in her book Walking with Abel. "Badkhen's rich and lucid prose illustrates her journey as vividly as might a series of photographs… By the time readers put the book down, they will have done something remarkable: visited a mostly inhospitable but eminently seductive locale alongside a storyteller able to render the strange and different both familiar and engrossing. Walking With Abel not only takes us somewhere new, it viscerally reminds us that such places still exist in the world." My Fulani cowboy friends drive their cattle on foot, in tinny bubbles of bootleg music. Music rasps from the cellphones they dangle on lanyards from their necks. It has the same iambic beat as the songs of the Tamashek-speaking camel riders of the Sahara, the Turkoman goatherds of the Khorasan, the horsemen of the Kazakh steppes. Music made for walking and cowbells. Music made out of walking and cowbells. My friends buy their music from itinerant bootleggers who set up makeshift stalls at the Djenné market every Monday and get away with charging the Fulani double the price: the cowboys, it is known, bargain poorly for everything except cattle. The music is downloaded onto cellphone memory cards. The cowboys don't bother with SIM cards—why spend money on calling people by phone when you will eventually run into them in the bush?—and use their cellphones to listen to music and store photographs of cows. A particular favorite is a Fulani griot named Dicko Oumarou. In the wilderness of the Sahel I heard his music almost nightly—this song, "Wilima Metatama," especially. My previous book, The World Is a Carpet, is set in a tiny village in the desert of northern Afghanistan, where my hosts were Turkomen shepherds who had abandoned their nomadic lifestyle. And what, I wondered, is the world when you live on the hoof? Human feet evolved to measure out steady steps on hot, dry, flat land, and the human brain evolved to absorb boundless geology at the speed of three miles an hour. Walking for a living must give an altogether different method to life's meaning. I wanted to tap into a slower knowledge that could come only from taking a very, very long walk with a people who have been walking always. I went to Mali to join a family of nomadic Fulani cowboys on their annual migration through the Sahel. Tinariwen was formed in the military camps of Libya's dictator Muammar Qaddafi, who recruited Tuareg men to be his mercenaries, dangling before them the hope that one day he would endorse the fight for their own independence. In 2012, after Qaddafi's death, some such mercenaries—though not Tinariwen's members—careened across the Sahara in looted pickup trucks chockfull of weapons they had plundered from the abandoned caches of their slain former padrone; swept into the major cities of Mali's north; and proclaimed the creation of an independent state they called Azawad: the Land of Transhumance. But within weeks, Islamist fundamentalists hijacked the rebellion and flew the black flags of al Qaeda over Timbuktu. They axed down centuries-old shrines and they flogged, amputated, jailed, stoned, beheaded, raped. And they transformed, too, the age-old routes of Fulani transhumance into the latest frontline of the global war on terror. The Malians rightly call Salif Keïta the Golden Voice of Africa. Perhaps it is the grief. Keïta was ostracized by his family twice: for being born an albino, a sign of bad luck in the Mandinka culture; and for choosing to become a singer—a low-caste profession unbecoming the descendant of Sundiata, the Lion of Songolon, the great Malian king. Today Salif Keïta is truly the king of Mali. You hear his music outside shops, on buses, in people's homes. I once heard "Folon" in a fetish market in Bamako. The song flowed magically from a stall laden with crocodile heads and snakeskins and birdwings and herbs and lichen and cowries. I looked closer. Perched among those mottled awful oddities was a tiny transistor radio. Because, while I was researching the book, I was missing someone very much. Growing up, Ali Ibrahim "Farka" Touré spent much time with his grandmother, a Songhai sorceress. In his beautiful slim gem of a book, Genii of the River Niger, the French anthropologist Jean-Marie Gibbal suggests that the great guitarist's "inspiration was a gift from God—and from the genii, who helped him when, as he was looking for something new to add to his music, he happened to use the djerkélé, the single-stringed instrument that particularly moves them." Ali Farka sang in many languages, and this song he sings in Fulfulde. Gambari tells the story of a great man who spoke Hausa—an arrival, most likely, from the north of modern-day Nigeria. Another wanderer. "Wipe your tears," the song goes. And we do. The blues arrived in the Americas in the cargo holds of slave ships: trussed, violated, mauled. Yet in the New World it unwound, relearning its own words, from mouth to mouth of millions of women and men who spoke mutually unintelligible African tongues—and then journeyed back to Africa via Europe in bales of cotton and peanut vines, to be retuned, resung, shipped back again. The triangle of slavery became, too, the triangle of sound. And on and on the blues ambles, adding modern guitars here, ngoni lute there. Bassekou Koyaté sings this blues for Bambougou, a town on the Niger River in cenral Mali, near Ségou. Bassekou Koyate is Bambara, but the record on which this song appears is called "I Speak Fula." I got to hear the opening bars of this tune many times: my friend and translator Amadou Gano used this song as his cellphone ringtone. "Do not give your children to be raised by others," the song goes. "Do not give your boys to be raised by others/Do not give your daughters to be raised by others/It only brings suffering and sadness." But when you don't have enough to feed your children in Mali you usually farm them out to someone who does. One of the translators I worked with, a Djennénke entrepreneur of means, was raising his own four children and also two nephews and a niece whose parents could not afford to provide for them. And my nomadic hosts in the bush were raising their two young grandchildren because their mother was divorced and perpetually ill and herself bounced from relative to relative, from clinic to clinic. When I squatted by the hearth to feed to the fire long knotty sticks of kindling, Bomel came over and smiled at me. "Are you missing someone, Anna Bâ?" I was? I was. I hadn't even noticed. "They say when a woman sings, she is missing someone." She squinted at me. "You sing to yourself a lot, Anna Bâ." This was the song: a ranchera about a village beauty spurned by a rich ranchero and driven to murder and madness. Or maybe about a weeping ghost tormented by betrayal and seeking revenge. In the Spanish-speaking America, La Llorona is ubiquitous. She is a deranged specter who kidnaps living children and drowns them in some stories; a mistress of Cortez in others. In every story, she is a madwoman who drowned her own children after her lover left her, a phantom dressed in white who weeps and weeps. This was the cheerful ditty I hummed all year on the road. I don't know why. It's catchy? After his beloved wife Pierrette died at childbirth, this popular guitarist from the northern Malian city of Kayes gave up music and moved to France to do construction work to support his children. It took, typically for our lopsided planet, a Western record producer to "rediscover" Boubacar "Kar Kar" Traoré in 1990 to bring him back to music—and bring his astonishing music back to the world. Traoré was almost fifty then. There is a great understatement in his songs, I think—a silence almost, a vastness of a kind that beautifully reflects the sparse immensity of Sahelian horizons. More by Bassekou Koyaté, a master of the ngoni—a fretless lute made typically of hollowed-out elongated piece of wood or calabash, goatskin, and three or five strings. Koyaté's band, Ngoni Ba, is named after the instrument. Today, ngoni strings are typically made with nylon fishing line—as are the strings on the ngoni's close relative, ganberi. In the past, strings were made with animal guts. From which beast, I wonder, came the strings circa 1352, when Ibn Battuta, the Moroccan traveler, journeyed through what today is Mali and who wrote that whenever the emperor Mansa Musa held court that "the singers go out before him carrying gold and silver qanābir?" The title means "That girl." Of course. This band, like Tinariwen, is Tuareg; its leader, Moussa Ag Keyna, at one point fought in the neverending rebellion against the governments of Mali and Niger, was severely wounded in battle, and had to recuperate in France. His band's name means "Identity." Of course. Part two—"didi" in Fulfulde—of the saga of the great Gambari, the Hausa-speaking man, the traveler from far away. Walking and cowbells, walking and cowbells, here we go again.